Tommy Glover, 1959 National & Kentucky Player of the year. Tommy is the only athlete in Henderson KY history to be named to a high school All-American team in any sport, and Tommy did it two times. Tommy is also the only player in Kentucky high school Football that was on 2 undefeated state championship teams. He accomplished this as an 8th reserveon the 1956 team, and a starter on the 1959 team. According to Coach Don Shelton, Tommy was the most outstanding football player in Henderson history. Shelton says in a 2009 interview that Glover was the best player that he coached at any level in his 30 plus years of coaching. Tommy also broke Don Shelton's 20 year record for the most touchdowns & yards gained for his 5 year career in Henderson. Tommy was selected as a high school all-American in during the 1958 & the 1959 football seasons. 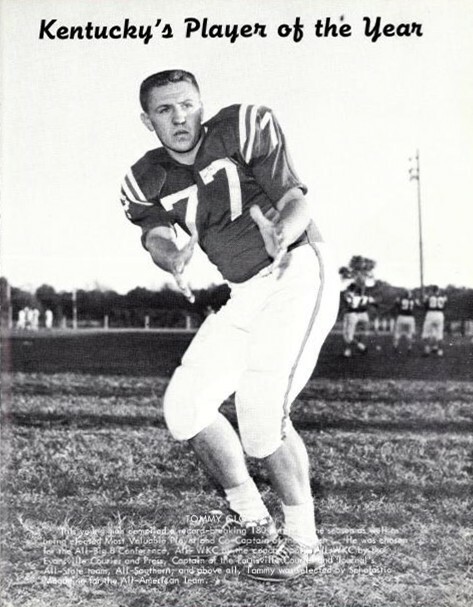 Selected for the 1959 first team high school All-American team and being named Mr. Football for the state of Kentucky were just a few of the honors that followed Tommy in his career. Tommy was also named to the little All-American team at Murray State University for the 1963 & 1964 football seasons. Tommy was named OVC (Ohio Valley Conference) MVP also in the 1963 & 1964 seasons. Tommy was drafted by the Pittsburgh Steelers in the 6th round of the 1965 NFL draft, and picked in the 5th round of the 1965 AFL draft by the New York Jets. Tommy was heavily recruited by most major universities in his senior year at Henderson City High. Tommy chose the University of Alabama, where legendary football coach, Paul "Bear" Bryant was the head coach, and personally recruited Tommy to play for the Alabama Crimson Tide. Tommy stayed at Alabama for his freshman year, and transferred to Murray State, where he once again was teamed with his former high school coach Don Shelton and assistant coach Bill Hina. Tommy was married to his wife Janet until his untimely death in December 2000 from congestive heart failure at the age of 60. Tommy is the only athlete in Henderson KY history to be named to a high school All-American squad in any sport, and Tommy did it twice, in 1958 and again in 1959. Tommy remains the only football player from the state of Kentucky that has been named to a schoolboy all-american team for 2 years. Kentucky High School State & National football Player of the year: Tommy Glover. 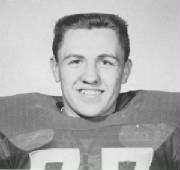 Tommy compiled a state record breaking 180 points for the 1959 football season. He was chosen All-WKC, All-Big 8, all-state & to the Scolastic Magazine All-American team for 2 years both his junior & senior years.Tommy was also named MVP, for district & Regional during his sophomore, junior & senior years. Glover was also chosen as MVP for the Big 8 & the WKC for his junior & senior years.